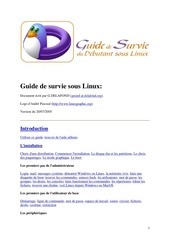 Ce document au format PDF 1.5 a été généré par TeX / pdfTeX-1.40.13, et a été envoyé sur fichier-pdf.fr le 09/05/2015 à 15:22, depuis l'adresse IP 105.98.x.x. La présente page de téléchargement du fichier a été vue 608 fois. Taille du document: 548 Ko (10 pages). 4.1 Create the partitions . . . . . . . . . . . . . . . . . . . . . . . . . . . . . . . . . .
4.2 Format the partitions and transfer HBCD to USB . . . . . . . . . . . . . . . . .
4.3 Making the second partition visible to Windows . . . . . . . . . . . . . . . . . . .
partition a USB flash drive and then persuade Windows to recognize the partitions. so that iso images are written contiguously. If an iso image is fragmented it will not boot. file will be fragmented. Always use a freshly formated stick where nothing has been deleted. read/writes will shorten their life span. Linux (from the Linux option of the main menu). plan to store large files,2 you may prefer to format it NTFS3 instead of the usual FAT32. Flush any pending buffered data. The syslinux installer lives there. Make the stick active, i.e. bootable. and change the label there too. • Reboot the computer and test the stick for booting. The actual capacity needed for HBCD is 2.9 GB. The spare capacity is available to store other files. Under FAT32 attempting to write file sizes greater than 4 GB causes data corruption without warning. Note, however that some self booting utilities (e.g. Acronis) may fail to start from NTFS. See Section 4. You can determine the correct device letters with the command: “fsarchiver probe” or “parted -l”. 2. Choose FAT32 or NTFS,2 and note the drive letter for later use. 3. Type the Volume Label HBCD152 (see note in Linux method). 4. Click Start to format the stick. • Copy all the files from the CD to the USB flash drive. the MBR and activates the USB for booting. • Safely remove the stick and test for booting. NTFS option is greyed out). Also, it is excruciating slow when copying files to the flash drive. with this utility do not meddle with any of the other settings. Although the NTFS file system can store large files without data corruption, FAT32 boots faster. FAT32 partition for HBCD and the remainder 12 GB will be formatted NTFS to store data. size and then it takes care automatically the proper sector alignments. 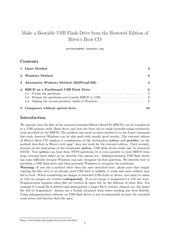 • Insert USB stick and HBCD and boot to SystemRescueCD as described in section 1. • Type the following commands. Start the partition editor on the USB device. Create the 4 GB FAT32 partition. 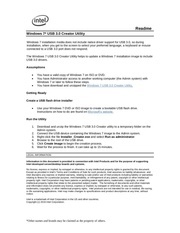 Create the 12 GB NTFS partition. Make FAT partition active (bootable). Exit from the partition editor. copy the HBCD files to the first partition. Reboot the computer and test the stick for booting. The second (NTFS) partition is also ready for use. XP. We can do this because the first partition is always visible. Windows allows partitioning and formating NTFS only for what it calls Local Disks. • Go to the Details tab and copy the Device instance Id. \Bootprog\usb-disk-driver. Open the file cfadisk.ini with Notepad and go to line 26. • Installing the driver. Boot into your installed Windows and go to the Device Manager. Wizard, and follow the sequence illustrated below. • Point the wizard to the folder where cfadisk.inf is found and install the driver. Do not restart the computer (ignore the message). Unplug and reconnect the flash drive. local disk with both partitions visible. flash drive as a Local Disk and be able to see all partitions. HBCD Program Launcher and run the utilities from the emulated optical drive, as described above. The utilities are portable and work with all Windows versions. If not available install them from your distro’s repositories. Ce fichier a été mis en ligne par un utilisateur du site. Identifiant unique du document: 00326088.